Sipper bottles comes in various colours, shape and size to put your logo so that while your employees are sipping water they are also absorbing the silent message about the company they are working and helping grow. Sipper bottles are on the desk and with the person throughout the day starting from early morning jogging till they return home from the office. Water sipper bottles are available in different price points depending on the usage and purpose. The sippers are available from 600 ml size to 1000 ml in various thickness to help you find the best choice within your given budget. You can select from various designs keeping the target audience in mind whether school going children, youngsters, adults, sports persons, office goers etc. You can select sipper with shakers too if that is the requirement or the flask to manage the temperature of the hot or cold drinks. The colour can be as per your house or logo with printing to ensure the end objective of brand recall is achieved. Material can be from plastic, aluminium, steel and even the combinations of two or more materials as required. Most of the sipper bottle shapes are such that you can carry it around along with a backpack by placing it at the side compartment. Shakers as the name suggest are used to mixed the health drinks with the protein and nutrient powder. Users prefer handy solutions while on the move and different types of shakers are available to fulfil the various needs. The simple one helps in mixing the fluid and the powder as you shake the bottle. 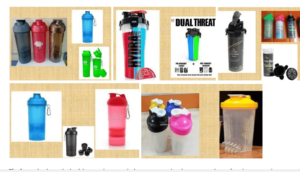 You also have the choice of two compartments to shake and keep two different choice of shakes as per the images shown below. The shaker comes with the fixed strainer which helps you mix the drink well as you shake the bottle vigorously. Few users prefer the metal floating mixer inside the bottle to mix and prepare the shake. The choice of branding is available by inserting a printed matter around the walls of the transparent bottle. Printing the logo and matter is the most common choice. You get various choice of shapes at the top depending on whether you would like to hold it, hang it or carry it around by inserting your thumb. 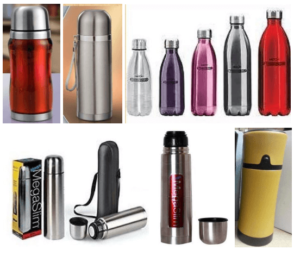 Flask can be branded with your logo and given to your business associates for the use at home and more at small offices to carry around the most commonly used drinks tea and coffee. The latest trend is to sip hot water and for that again the best answer is a flask which can be branded with your logo and message. The capacity ranges from half a litre to 1.5 in usual cases. The outer body can be plastic, aluminium and steel with or without the cup to make it handy to drink while on the move or at the desk. The thickness of the material decides the quality and number of hours one would like to keep the drink hot or cold. Laser engraving is the most preferred branding to ensure that promotional mileage is derived from the money well spent on creating awareness and brand recall.